A small sand coloured crab, with a box-like body and long eyestalks, found commonly across the beaches of the Galapagos Islands. 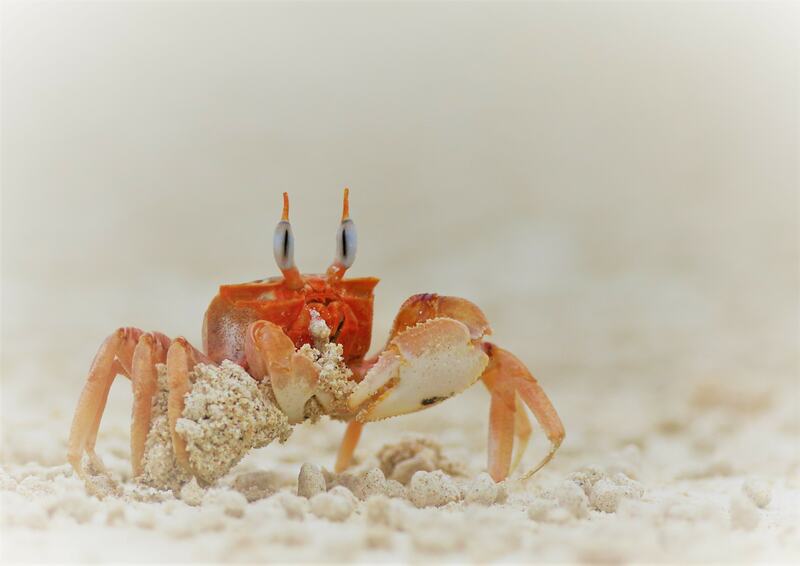 Ghost crabs are commonly found on tropical and subtropical sandy shores across the world. There are over 20 species of Ocypode around the world. Two of which are in the East Pacific (Ocypode occidentalis and Ocypode gaudichaudii). Ocypode gaudichaudii are found all along the eastern Pacific coast of Central and South America. They are a small, red-orange crab with sandy dots across the back of the carapace (hard upper shell). They have a box-like body, thick elongated eyestalks, and one claw is larger than the other in both males and females for feeding and digging their burrows. Their eyestalks allow them to see 360ᵒ to detect potential predators and prey. Their vision is so precise it allows them to grab insects out of the air. The only blind spot they have is directly overhead. The eyestalks are tipped with horn-like projections called styles. Their large eyestalks and long slender legs are useful adaptations for terrestrial life. They spend most of their lives in the intertidal zone and are unable to swim. Although, females carry their eggs beneath their bodies and frequently enter the water to ventilate the eggs by turning them upside down and then return once ready to release them in the water. 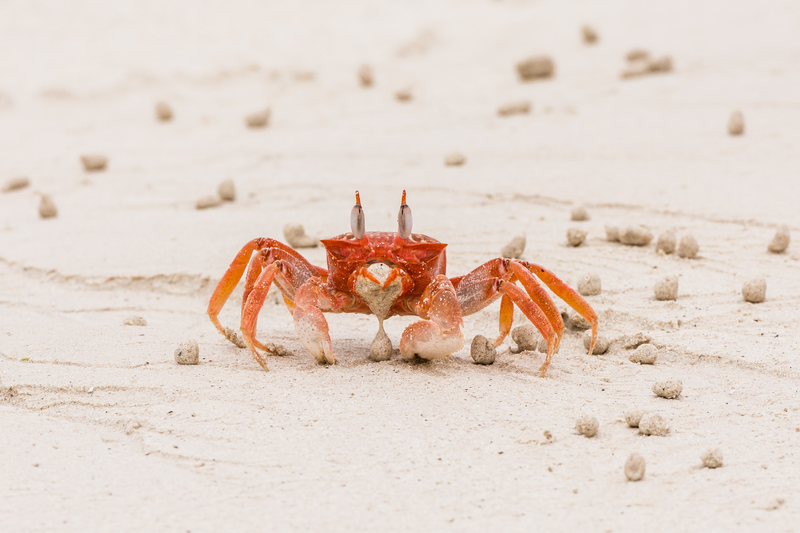 Ghost crabs are the fastest runners of all crustaceans reaching 3.4 m/sec and move more than 300 m a day when feeding. This has earned them the nickname “el carretero” or the “cart-driver” crab in Peru. Ghost crabs are mainly detritivores but are also active predators and scavengers. They eat organic matter such as algae and animal detritus found among the sand, as well as dead fish, insects, and marine organisms. They leave large numbers of little sand balls across the beach which they have searched through for food. Ghost crabs in the Mediterranean have been known to predate on eggs in sea turtle nests. Where to see them: They can be seen on the beaches all around the Islands. When to see them: Ghost crabs can be seen active during all hours of the day, but are most active at night when they emerge from their burrows to maintain them or forage. Threats: Shorebirds and gulls are native predators but they are also preyed on by introduced rats, cats and dogs. They could also be at risk from marine plastic pollution. 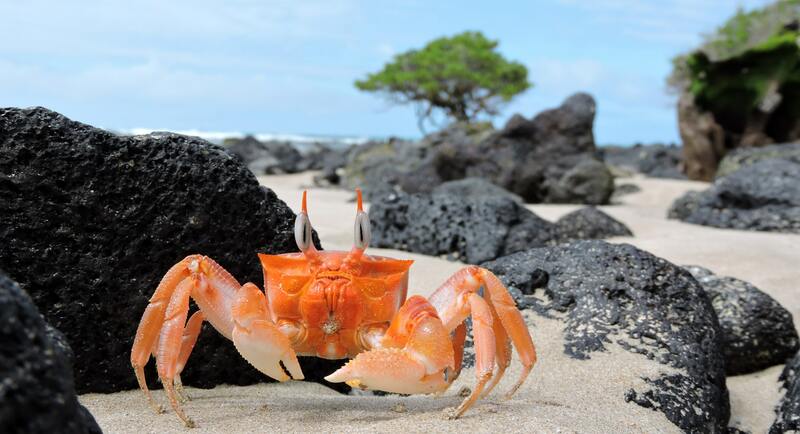 Conservation Actions: There are currently no projects specifically focused on the conservation of the Galapagos ghost crab. We are working with partners, however, to assess the risks of marine plastic pollution to wildlife as part of our Plastic Pollution Free Galapagos programme. Help protect species like the ghost crab by donating to our plastic programme today!